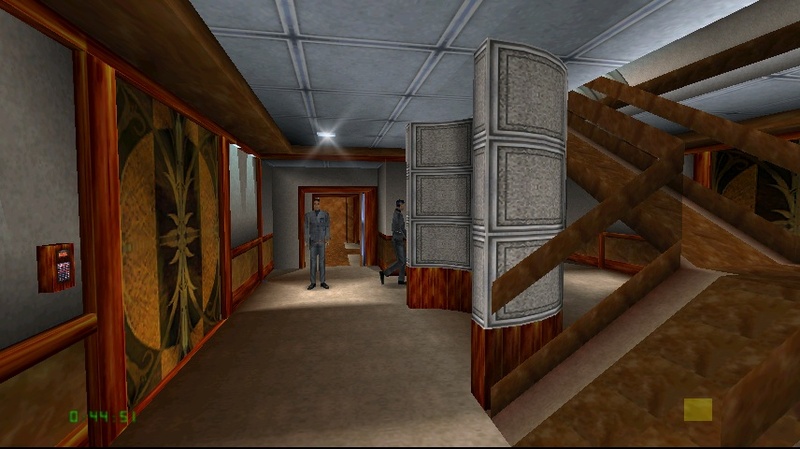 See, this is what I love about Perfect Dark- even 10 years after you finished the thing it’s a game that keeps on giving, much like Cilla Black…or leprocy. Myself and Mr. Coldicott fired up the XBLA (Xbox live arcade, actually having had to explain what that abbreviation stood for completely negated it’s initial use) version of Perfect Dark last night and set about our favourite past time- breaking games. Now Mr. C is some kind of unholy glitch magnet, so if something can go wrong with a game he’ll usually find it. He explained to me that he’d had a lot of fun on the Airforce one level- disarming all the presidents bodyguards, which would send their Ai a bit nuts as they all still thought they had their guns, albeit jammed. This would leave you with a room of ten guards all leaping about cycling the same animations over and over. Well I was sold- I asked him to jump in and show me. Show me he did, and we laughed. Next was my turn- so I took a different approach. This time I ran straight for the presidents room and introduced him to the finest of knuckle sandwiches before he could accuse me of being a terrorist and setting the dogs on me. I awaited the barrage of bodyguards, armed to the wisdom teeth with guns bigger than the average family dog, to arrive. They did not arrive. Well bugger them I’ll go looking for them. When I found them it seemed I’d become invisible to them. I walked right up in their face and everything. They didn’t want to know. It’s only because one of them was blocking my way that we discovered the shuffle! I shot one in the leg to get him to move out of the way, which worked as planned except with a little bonus. Seems now he would follow me like a faithful lapdog…yet still ignore me. I wondered if it would work with any other guards…seemed it did. All of them! If you’ve come across any perfect dark glitches of your own then why not leave them in the comments and we’ll try them out!